Looking for a loudspeaker that stands out? Forget a wooden cabinet with a cherry veneer, because Swedish manufacturer Audio Pro has upholstered its new Mondial range in black and brown leather. 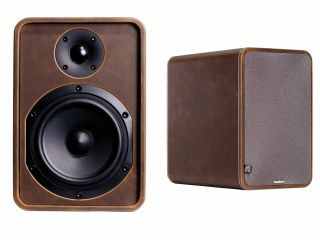 "Unlike the space-age synthetics of many speakers," says Audio Pro, "which might look nice in a chemist's shop, Mondial's leather has a character more in keeping with softer furnishings and richer, more organic interiors." The Mondial range itself consists of three monitor speakers - the mini M1 model (£149 per pair), the slightly bigger M2 (£199 per pair) and the muscular M3 variant (£249 per pair). The M4 centre speaker (£139) is designed to be paired with the M5 floor standers (£399 per pair), each one packing a 1-inch super tweeter and 3.5-inch mid bass drivers. Audio Pro's leather clad product line also extends to the S1 (£249) and S3 (£319) subwoofers. A half-decent 5,1 channel surround system (comprising the M5, M4, M1 and S3) will set you back £999. For more information about the Mondial range (available to buy in September), head over to www.csesolutions.co.uk . For full specs, visit the Audio Pro website .